His next words were cut off by the sound of a woman screaming. It echoed through the trees from somewhere uncomfortably close. Makani turned towards the scream, “Let’s go!” She darted up and grabbed branches and roots to keep balance, heading straight to the entrance of the trail. But instead of crossing the stream back to the jeep, she started through the bamboo grove, the sound of Flynn’s footsteps right behind her. “There, just up ahead,” he hissed, making her jump. She slowed down, careful to keep her knife at the ready. Her feet were nearly silent, even on the thick covering of dead leaves. Just through the grove, in a clearing to the side that opened up to a small off-shoot of the stream. Laying on the mud and rocks, was something that might once have been a person. A woman. Bent over it, was something completely different from the things they had seen in the cave. “What the hell?” she whispered as she tightened her grip on the knife. “What is this, the bloody Hell-mouth?” Flynn had stepped up beside her. She could see his face whiten in the corner of her eye. “What is it? Will salt even work?” Before she could stop him, he brought the salt up and flung it, sending a spray of crystals through the air. The creature turned reptilian eyes at the two, and its mouth gaped wide. Sharp teeth, still coated liberally with the gore and blood that had been its victim, gnashed and clawed fingers gripped the ground. Its head was indented into a bowl, and it held water that sloshed over the side and ran over its face. The salt, unfortunately, didn’t do anything. It just made the creature very upset. She pushed him again, going the opposite direction. “Just split up! Keep quiet! Get away from the water! Now!” She maneuvered herself between the bamboo, narrowly avoiding the broken stalks that jutted up. She made as much noise as she could, keeping herself in line with the trail that split the grove up the side of the valley. He went the other way, in the direction of the jeep. She moved high up the hill, keeping her ears open for anything. Makani knew the stories, having heard them as a kid running up and down the valley with her siblings. She would never have believed them, though. Not in a million years. But faced with this thing, after everything they had seen… what else lived on this island? Erin: Maybe? I recall starting a lot of stories but never finishing them. The first time I finished a story, I was 11. The first time I finished a story well, I was 15. Mirren: I’ve always written. I’m not sure I’ve always written well, but that’s the point of practicing and growing. Erin: Twilight. No, seriously – if not for the success of the series and subsequent trends in writing and readership, I would never have considered dipping my toes in the water. That, and Mirren gave so much of herself to get things going for both of us. Without her support and legwork, nothing would have gotten out of the water. Mirren: That’s pretty much how our collaboration started, yes. We were discussing the popularity of that and also 50 Shades of Grey and that we’d certainly write things differently. I’d never claim to be trying to be better than anyone, but we wanted to write something our way, but have wide appeal. I think we’ve done that with this series. 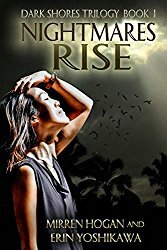 Erin: Nightmares Rise is book one of a trilogy. And, if the winds blow the right way, there may be a companion book to them. Keep your eyes peeled! Mirren: What Erin said. Book 2, Shadows Deepen should be out in early 2018. Erin: The genre chose the book. Actually, there were a few factors. First, romance comes naturally, which is ironic. Second, being raised in Hawaii meant I was constantly surrounded by stories about the supernatural. It’s just a part of the collective culture that comes with so many people mingling in a confined space. Those stories live on long past the teller or the culture that birthed them. It seemed only right to bring these spooky beings back to life in the modern world. Mirren: We also wanted an exotic location which was familiar to one of us. Where in the world is more exotic and appealing than Hawaii? And the genre fit in afterward. Know that every story has already been told already but not by you, so it’s worth telling. Your vices will be your constant companion through the process. Try to develop some that are healthy. Nothing comes from a vacuum. Be prepared to work hard: finishing a story is tough but editing your own work is harder. And finding someone to publish it is even worse! But if you believe in your story, it deserves to be released into the world. A strong support system comprised of anyone who will listen and give honest feedback is absolutely necessary. They may not always say what you want to hear but they will assist your growth in vital ways. Mirren: I agree with all of that, plus read, read, read and read some more. It’s the best way to train your mind to understand the methods used to put together a good story. Also you can see what you think doesn’t work and avoid that in your own work.